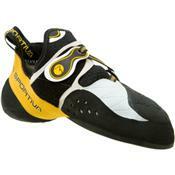 La Sportiva created the uniquely styled Solution Climbing Shoe to give you the advantage on cutting-edge boulder problems. The highly down-turned toe lets you edge on the smallest crystal, and a rubber toe cap hooks solidly for difficult bicycle moves. La Sportiva used the single-pull Fast Closure System lacing to get you in and out of the Solution quickly, so you can attack your project when inspiration strikes. To top it off, a Permanent Power Platform and molded 3-D heel cup help the La Sportiva Solution Climbing Shoe hold its down-turned shape and let you take full advantage of the ultra-sticky Vibram XS Grip2 rubber.